Amazing Auction Items include trips to New Orleans Jazz, New York, Napa Wine Country, Players Golf, Kentucky Derby, Top Gun Experience, and silent auction items from Peachy Canyon Winery, Cass Vineyard and Winery, Le Vigne Winery, Cigars from Brazil and The Sanctuary, and much more! COSTUME PRIZES - DRESS UP! Categories include "classic 50's/60's", "Shag-a-delic", and "Carnival!" Featuring a LIVE AUCTION, SILENT AUCTION, AND WINE RAFFLE! WE'RE HAVING A FUN BOSSA NOVA PARTY WITH COSTUME PRIZES (CATAGORIES INCLUDE: CLASSIC 50's/60's, CARNIVAL, SHAG-A-DELIC). SO HAVE FUN! THE MUSIC WILL BE FLOWING WITH THE "DANCE OF LOVE" THE BOSSANOVA AND WE'LL HAVE A SILENT AUCTION, RAFFLE PRIZES, AND A LIVE AUCTION. ALL PROCEEDS BENEFIT SLO JAZZ FESTIVAL, OUR JAZZ EDUCATION, AND MUSIC HEALS - A COLLABORATIVE WITH ALONG COMES HOPE (HELPING CHILDREN AND THEIR FAMILIES WITH CANCER THROUGH MUSIC). CORPORATE OR GROUP TABLES ARE AVAILABLE FOR *JUST* $650.00 - INCLUDES 2 BOTTLES OF QUALITY WINE BY EITHER CASS OR LE VIGNE WINERY, NAME ON TABLE, LOGO AND PARAGRAPH IN PROGRAM, LOGO AND LOVE ON SOCIAL MEDIA (4,000 FOLLOWERS), AND OVER 800 EMAIL THROUGH AN EMAIL WITH LOGO HONORING AS A SPONSOR! SO, GET INVOLVED, LET'S MAKE IT A NIGHT TO REMEMBER! 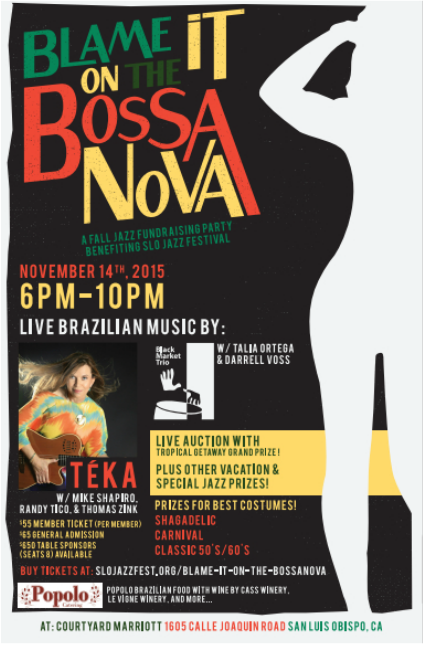 NOTE: OUR LAST BOSSANOVA PARTY SOLD OUT, SO DON'T WAIT TO GET TICKETS, THIS WILL LIKELY SELL OUT, TOO!